The Dynamic User Interface in Finish Genius Pro 2.0 provides connectivity port with equipment and process devices. Both Standard Data Integration Portals and Custom Automated Equipment Data Integration are offered. Data Streaming – See how FG can create data streams in real-time. • Click on the ‘Dashboard’ menu item to see a list of your work Processes. 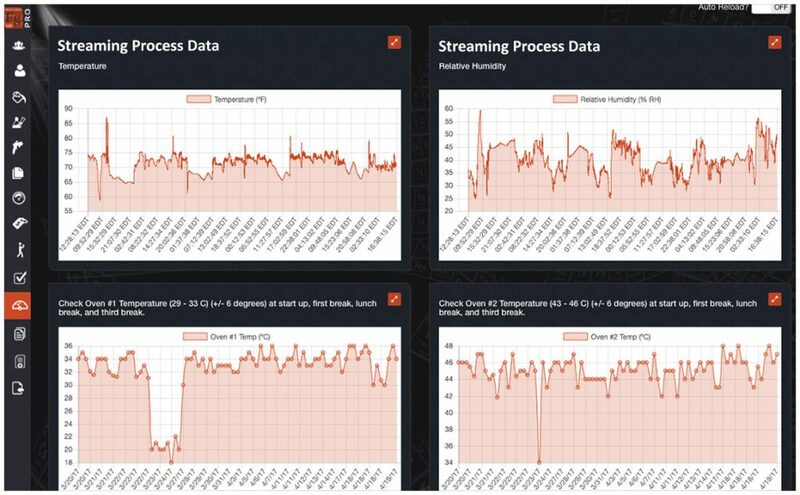 • Click on the ‘Graphs’ button to see real time streaming data of your process. Both Standard Data Integration Portals and Custom Automated Equipment Data Integration are offered. Internet Based and Locally Hosted device application available. Temperature and humidity devices available in all FG Pro & Pro+ versions. One time charge of $495/device, device setup included. For advanced data streaming connectivity in medium and large shops, call for custom integration and standard device connectivity pricing. FG PRO+ license required.